SEM3D generates 3D image from the continuous SEM images of FIB processed LSI. SEM3D strongly supports structural analysis with the cross-section display and the 3D display of inter structural objects. 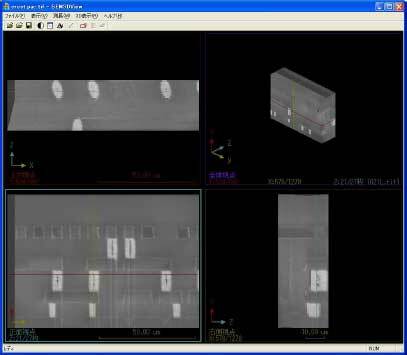 Generated 3D image can only be viewed by our exclusive software SEM3DView. It helps prevent the draining of data. Reconstruction of sectional images from the generated 3D image. 3D View of the inter structural objects.